Nashville, Tn — The Nashville Predators put on a scoring exhibition tonight in Smashville, defeating the floundering St. Louis Blues, 4-1. Nashville’s Frederick Gaudreau put the Predators on the scoreboard first at 6:14 of the first period, scoring his first NHL goal and Nashville took the lead, 1-0. Gaudreau tapped in the rebound off of the original shot of Anthony Bitetto for the score. Robert Thomas then tied the game for St. Louis at 12:39 of the opening frame with a wrist shot that beat Rinne on the high side for the 1-1 score. Filip Forsberg then put on a show at the 13:22 mark of the second period on a shorthanded breakaway. 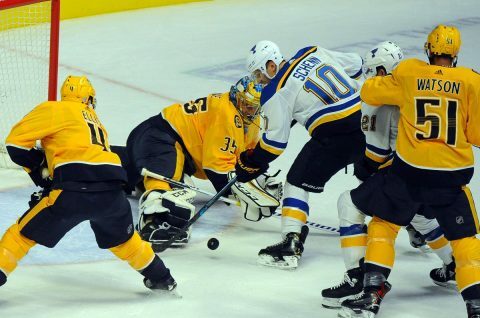 “Flip” intercepted a pass at the blue line and beat Blues goaltender Jake Allen on the glove side. It’s a goalies worst nightmare to see Forsberg bearing down on you one-on-one. Austin Watson got into the scoring column for his first goal of the season at 7:53 of the third period on a wrist shot from the half wall, and the Predators took a 3-1 lead. Watson received a roaring ovation from the Bridgestone Arena crowd after his score. Watson served a suspension for an off ice domestic incident involving his wife, but was recently reinstated to the team. The final tally of the night was on a shorthanded, Ryan Ellis score into the empty net of St. Louis and the final score was 4-1. The Blues had pulled their goalie, Jake Allen to give St. Louis a 6-3 advantage on the power play. Nashville will travel to St. Louis on Friday night for the home and home series. Puck drops at 7pm. 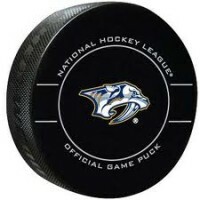 Nashville will then host the Anaheim Ducks on Sunday night at Bridgestone Arena for the 7pm puck drop.